Rome’s official officer ordered the stone rolled back. 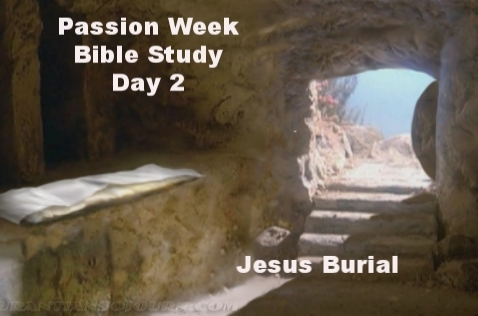 Then he went into the tomb and examined the body of Jesus to verify that it was Jesus and that He was really dead. The chief priests and elders entered the tomb with Rome’s official officer so they could look upon Jesus’ dead body and put an end to their worries that He had somehow survived. Roman guards checked the contents of the tomb because they wanted to know for sure a body was there. They didn’t want to be guarding an empty tomb that would later be used as a claim of resurrection, while they got blamed for the disappearance of Jesus’ body. After all of these inspections were complete, Rome’s official officer ordered the stone rolled back in its place. While the chief priests, elders, and Roman guards watched, he secured the site and sealed it shut with the seal of the governor of Rome. Regardless of all these efforts to secure the site and to keep Jesus inside the grave, it was impossible for death to hold Him. When preaching on the day of Pentecost, Peter proclaimed to the people of Jerusalem, “…Ye have taken, and by wicked hands have crucified and slain [Jesus]: whom God hath raised up, having loosed the pains of death: because it was not possible that he should be holden of it” (Acts 2:23,24). 1 John 3:16 (NKJV) states, “By this we know love, because He laid down His life for us. And we also ought to lay down our lives for the brethren….” What are some ways you can lay down your life for others? This Third Word from the Cross also reveals the relationship of Jesus with his disciple John, the one who had been closest to him. It didn’t require a long explanation for John to know what was meant. We read that from that hour John took Mary into his own home. The question might be raised, "But why was not Mary committed into the care of one of her other children?" The answer is probably because they as yet hadn’t received him by a living faith. John was ready and acted without hesitation. It has been said that this Word from the Cross is the least theological, but practical application of the gospel must never be separated from its message. It is only as theory is translated into practice that relationship with Christ becomes a living reality. This Word tells us that there’s love for you in the cross, and it’s a love which having been received, is to be shared with others. 1). Where did they lay Jesus to rest after his death?